“The Wolves” by Sarah DeLappe is a directorial success at Oklahoma City University. Courtney DiBello cast ten extremely talented students and 3 ‘swing’ members in this interesting work. 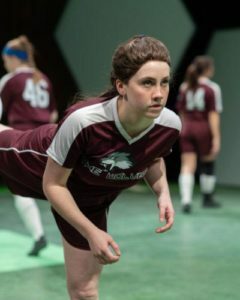 The award winning play is written for an ensemble group of young actresses as they warm up for their weekly soccer game. The two act-play brings the modern approach of telling several intertwining stories rather than concentrating on one single drama and, perhaps, a subplot or two. DeLappe is a young playwright creating typical teens undergoing common growing pains. As the play progresses it becomes apparent that each story is unique and atypical. The girls are known by numbers on the back of their jersey; it is only in the second act that we hear a few actual names. They squabble a bit as they practice, making fun of the new girl as they discuss the current headlines. In the second act, the squabbling becomes a bit more serious as they deal with every-day problems from periods to boyfriends, pimples to school. Then, they are confronted by greater difficulties. The team is led by the captain, #25, played by Olivia White. She tries very hard to control her peers as their current coach seems to be hung-over. The goalie is #00, portrayed by Kelsey Bray and she is prone to be sick and doesn’t speak until the second act whereas #13, Kaiden Lynn Matthews, stands out as a bit of a loud mouth. The new girl, #46, is doing her best to fit in, and she is artfully played by Jacqueline Bennet. Bailey Huerta is #14, and she is very relaxed in her demeanor while Dani Pike (#7) is more emotionally volatile. Emma Grey is a committed #8 and Amanda Kronhaus (#2) is also devoted to the team. Tierra Matthews is #11, and seems to be the most poised among the young women. Shelby Parker plays the only adult seen on stage, the Soccer Mom who visits the team practicing for the important game her daughter would have played. While Parker does a magnificent job of portraying a grieving adult her fellow cast members all do a superb job of connecting with younger girls. They are not so far removed in age from the actresses, but it as wide gulf to create those teen years with the young adult. The entire crew of actresses meets their goals gracefully as we see them practicing to make their game goals while they prepare for life. DiBello’s direction for “The Wolves” is compassionate and clear. She gives each of her performers the motivation to develop complete characterizations, often a difficult task for ensemble pieces. All of the actresses are competent, an essential ingredient for smooth team work—in fact, both teams acquaint themselves quite well! Additionally, they are talented, thoughtful young women, who have all the skills and commitment for success. “The Wolves” plays at the Burg Theatre through Sunday, February 3, 2019. Curtain is at 8:00 pm with the Sunday performance a 2:00 pm matinee. The Burg Theatre is located on the OCU campus at 25th and Blackwelder in Oklahoma City. For tickets and information call the box office at 405 -208-5227.